PatternGrid now in stock and ready to ship. Order online at www.patternman.com. The PatternGridÂ® Jr. was designed to make the use of pantographs and pattern placement easier for the domestic machine framed quilting system. No more guesswork on whether or not your pattern is straight or if it will fit. Let The PatternGridÂ® Jr. do the work for you. Not only will the gridlines help you with design placement, it can also help with custom design work. Performing custom design work is fun and effortless. A wet erase marker is included in a kit to mark your custom designs. This marker writes nicely on the mat and wipes off easily with a little water. 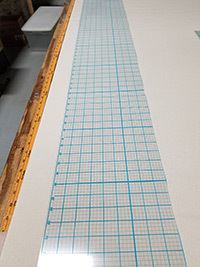 The PatternGridÂ® Jr. measures 9 inches x 12 feet, with 1 inch blocks and 1/4 inch dotted lines and is made of a 10 ml. rigid plastic. Kits include a wet erase marker, 8 oz spray bottle, ruler, and cloth for wiping off your wet erase marker.